Hello there, thanks for stopping by! You may not have noticed on your way in, but we're under a bit of reconstruction right now, we've decided to try to revive the all around gaming goodness that we love about this blog, with our cute kid reviews (Katie has been joined by her friend Sabine and between them you can expect some awesome gaming analysis from a 6 yr old point of view! ), our thoughts about family gaming, experiences in the gaming world, discussion about game design and education and how they relate, raving about our favorite game, etc. It's all coming back! We're on Twitter and Facebook, on Boardgamegeek, and anywhere else where people want to talk to us. As we get all this sorted, we'll try to make the links easy to find, so come on back here and we'll have some new gaming content for you. We're going to try to get posting on a regular schedule and with Julian and Sabine joining us, plus Jack old enough now to have some ideas to share, I think our little team will be able to deliver some content we hope you'll enjoy reading. Thanks for checking in, and since we don't yet have the Escapde Games Blog ready to roll, I'm going to drop this amazing preview here for now.... its the box cover art for Story Realms!!!! "Welcome to the world of Storm Hollow, where endless stories have been told about boys and girls just like you, ordinary in their world but with an extraordinary calling to heroism, you've come here to this world because we need your help. Storm Hollow is a land of magic and mystery, where great stories are told of the Poppins, folks like yourself who have popped right in to our world. Its an amazing place, a place where stories come to life, and today's heroic deeds become new chapters in the everlasting book of the Eddur. But beware, because the minions of the Dark are all around, lying in wait in the shadows; plotting, watching, waiting for us to let our guard down. Be vigilant, stand strong, and always look to the light. Your adventures here will be your own, you decide your path as you walk the land, and the choices you will make will determine the course of events to come. So begins the new Age...but instead of rushing off to meet your fate so fast, Little Poppins , why don't you stay just a while and play?" If you haven’t yet, check out Part 1, Part 2, and Part 3 of our Adventuring Kits preview to learn all about Story Realms’ fun take on basic adventuring equipment. Today we’ll be finishing up our preview of Adventuring Kits by revealing the final two starting Adventuring Kits for the game. First off, we have the Daredevil Kit! The Daredevil Kit is for the hero that isn’t afraid to take big risks and doesn’t let dangerous terrain get in the way. This kit is well suited for a player that wants to feel like a classic, high fantasy rogue that scales walls and performs amazing feats of acrobatics. Of all the Adventuring Kits, the Daredevil Kit is probably the best suited for the player that just wants to seem cool. 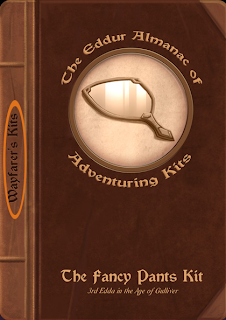 The final Adventuring Kit we have to reveal is a favorite amongst the Growing Up Gamers crew. It’s fun and a bit silly, but it has still proven very useful. It’s the Fancy Pants Kit! 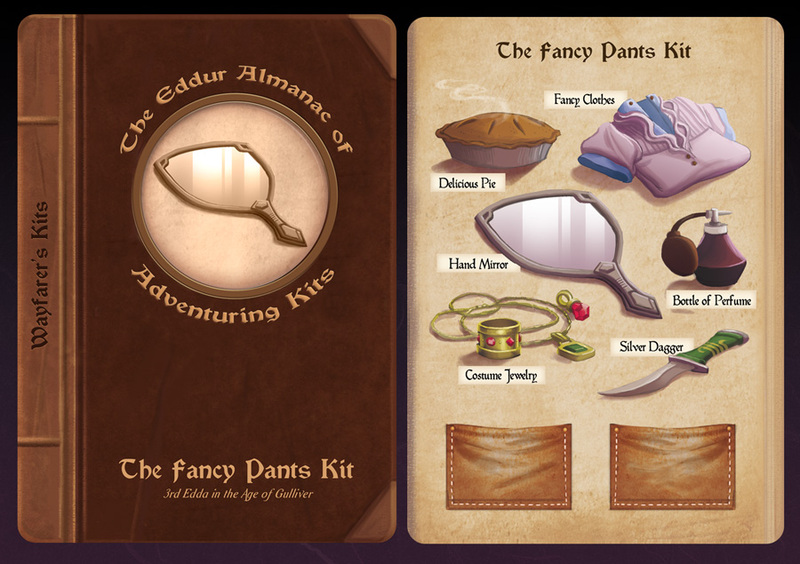 The Fancy Pants Kit is for the hero that likes to look good, smell good, and eat well. Of course, it’s not all flashy accessories, that shiny, silver dagger can do a lot more than just look pretty. Though it may seem a bit odd for going out on an adventure, the Fancy Pants Kit is actually the only kit that’s worked so well it hasn’t been revised since its inception. It’s because the Fancy Pants Kit is one of the best embodiments of what makes Story Realms so different. Story Realms is not a game filled with complex rules systems that have a hundred different ways you can stab a monster with a pointy stick. The rules are designed to be relatively simple. The reason for this is not to remove options, but rather to open them up. The game is designed to accommodate and encourage players coming up with creative solutions to problems. In this way, that Bottle of Perfume is just as effective as the Grapple Launcher or Climbing Gear. It just depends on the situation and the player’s plan for how to use it. With this in mind, we tried to fill the Adventuring Kits not just with classically useful items, but items that players would have fun using in interesting ways. This game needs more delicious pie! We realized that we needed to focus on creating as many moments of pure joy for the players as we could. We went back over all kits and made sure each one had an item that we thought was just pure fun. Something to draw a smile. In general, we’ve used that phrase to guide our thinking across the entire game. At every turn, we are trying to make sure that we are giving the players and the Storyteller the tools to do something exciting and creative. We don’t want to railroad them into solving every challenge by bashing the problem with weapons or using the same gear that’s in every other fantasy themed game. So That’s All the Adventuring Kits? We hope you enjoyed this preview of our Adventuring Kits. However, these are not all the Adventuring Kits that come with the game. These are just the ones available at the start of the game. If you glance at the side of the card back, you’ll notice that it says Wayfarer’s Kits. This is to designate it as a particular set of six kits. The game comes with an entire second set of six more Adventuring Kits that become available when you reach the main hub city of the game. If the game is successful, you can also bet that more Adventuring Kits will be included in future expansions to give the players lots of cool choices about how to equip themselves. We are super excited about Story Realms, and we are obviously eager to talk about it. We will be doing even more Story Realms previews in the near future. However, we don’t want Story Realms to run away with this blog too much either. To that end, we are currently revising the Escapade Games website so that it will have its own blog to host future Story Realms previews. We will still let all our Growing Up Gamers know when those previews are available to view, but we will keep the bulk of that content off this site. We want to get this blog back to focusing more on what it’s meant to be. We’ll be bringing back a lot more of the game discussions and reviews, educational topics, and wacky family antics real soon. If you’ve been missing that stuff and craving more of it, hang in there and thanks for sticking with us! 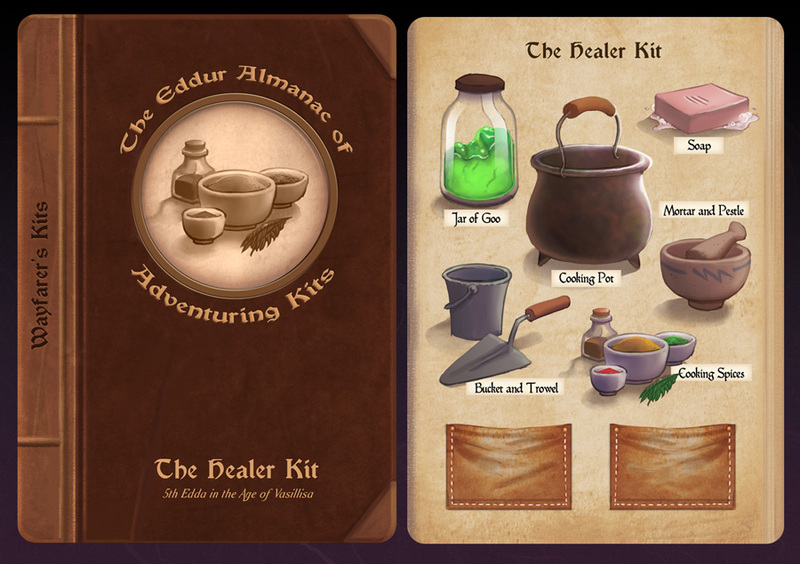 All this week, we are previewing Adventuring Kits from our upcoming storytelling adventure game, Story Realms. In Part 1 and Part 2 of our preview, we revealed the Wanderer Kit, the Wizard Kit, and the Healer Kit. 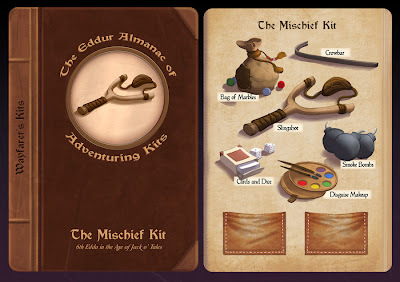 Today, we bring you the Mischief Kit! As you can see, this kit allows you to get yourself into a wide range of trouble. Whether it’s playing games, playing tricks, or just breaking and entering, this Adventuring Kit has got you covered. Now to be clear, Story Realms is not a game of moral ambiguity. The players are always the heroes and their goal is always to save the day. The Mischief Kit isn’t really meant to facilitate felonious skullduggery. Instead, it’s the gear for the heroes that like to avoid charging into battle and would rather overcome a challenge with a little deception or playful trickery. Seeing these Adventuring Kits and their eclectic assortment of items might make a person wonder what the specific rules are about how these items work. The short answer is: they just do. Outside of the images and the names of the items on these cards, the game does not provide any detailed rules about what you are supposed to do with them. For an experience gamer, this may seem shocking and a bit uncomfortable. All I can say is that we’ve been playtesting and it simply just works. 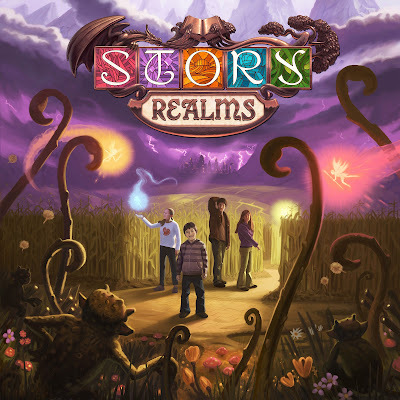 Story Realms provides the players with challenges that encourage the player to come up with creative solutions. The items in an Adventuring Kit are kind of idea starters. They help shape the type of actions the player will decide to take. Think about it, do you really need lengthy rules to tell you what happens when you throw a smoke bomb? I’m guessing you probably know that it lands and makes a lot of smoke. This probably makes it hard to see. Maybe it could even cause someone to cough and hack a bit. The Storyteller and the players are free to interpret the use of an item as they see fit and describe its effects in whatever way best suits the story. I must, however, admit that in our last preview I told a little white lie. I said that every rule you needed to know about the items in an Adventuring Kit was right there on the card. That’s not actually true. There are no detailed rules to describe the function of each individual item. However, there is one rule, not written on the cards, you need to know about how all of these items work. The reason that the game doesn’t worry too much about specific rules for an item is that any heroic use of an item in your Adventuring Kit is tied to a Skill Roll. Which Skill you use depends on what exactly you are trying to do. We’ll talk more about skills on a later preview, but for now just know that there are only six skills and each skill has a certain number of dice you get to roll (1, 2, or 3 specifically) to try to accomplish your goal. If you use an item from your Adventuring Kit that is appropriate to the task you are trying to do, that’s called having “The Right Tool for the Job” and you get to roll 1 extra die. Trying to escape a horde of monsters? Smoke Bombs make for a good getaway! That’s +1 die to your Move Roll. Have to pry open a locked door? Crowbars are good for prying open things. That’s +1 die to your Might Roll. In this way, the game gives a simple but effective way that items in an Adventuring Kit can have a real impact. Remember that Story Realms also gives players access to powerful magical artifacts that DO have unique rules and strange powers (printed on the item card), but that’s not the purpose of Adventuring Kits. Adventuring Kits are simply the fun and creative tools players can use to aid any task they might try. Why not have more swords and armor and traditional stuff? You may notice that while our Adventuring Kits are filled with fun and interesting items, they don’t have as much of the mundane, traditional adventuring gear that you might see in other games. If you're curious about exactly what went in to choosing these types of items, you should check back in later this week where we will talk about the philosophy behind the Adventuring Kits and reveal a few design goals you can see at work across the entire game. More fun with Adventuring Kits! Last Friday, we kicked off a week long preview of Story Realms Adventuring Kits. These cards are the Story Realms solution for making adventuring gear fun and easy. 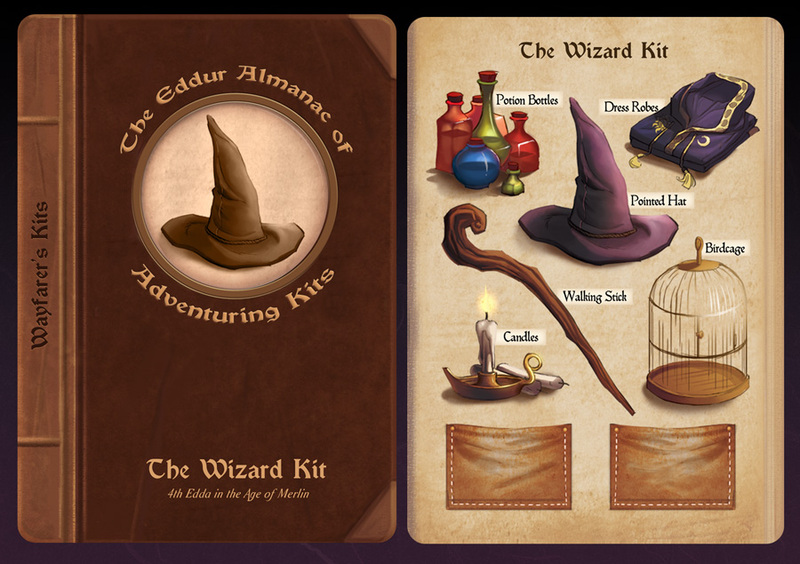 We started by revealing the Wanderer Kit and the Wizard Kit. This fine morning we are continuing our preview by showing off the Healer Kit! As you can see, healing in Story Realms is a little more herbalism and little less trauma surgery. Magical healing is also possible, but even then, a properly mixed poultice might aid the effort. We’ve tried to keep the items in the kits a mix of straightforward and surprising. A cooking pot is fairly self-instructional, but that jar of goo might be anything! Adventuring Kits are meant to be used creatively and spark imaginative solutions to the challenges of the story. Of course, with an Adventuring Kit like the Healer Kit, you might feel a bit specialized. Sure, you’re totally prepared to gather strange plants, mix odd herbs, and cook up something crazy, but what if you need something a bit more practical? Well thankfully, you probably remembered to pack it in your pocket. In Story Realms, we want players to have fun with their adventuring gear without ever having to pour over lengthy equipment lists to make sure they packed the right thing. To this end, we try to build the challenges of every adventure in such a way that there are multiple avenues of success. You’re never stuck just because you forgot to bring along some rope. However, with only six items to an Adventuring Kit, there is the strong possibility that a player may want to pull something out of their pack that simply isn’t there. That’s why every Adventuring Kit has two pockets. These pockets are full of possibility! Twice during an adventure, a player may attempt to pull absolutely anything that could reasonably fit into a backpack out of these pockets. In playtests, we have seen players try for handy things like rope ladders, pretty things like gemstones, and crazy, madcap things like wrist-mounted, automatic chicken launchers. All valid ways to go on an adventure. If you can think it up, you can probably find it in your pack. Getting what you want is not a guarantee, however. You have to roll for it. Whenever you search your pack for something, you have to make a Grab Roll to see if you dig out the right item. To do this, you simply roll two dice. A single hit on one of the dice means you pull your heart’s desire right out the pocket. The odds are strongly in your favor to succeed (75% for the math-minded), but once in a while you will go searching for a trusty knife and come up with something else entirely. If the roll doesn’t succeed, you still put a marker on the pocket to show that it has been “used up” for the adventure. However, you don’t come away empty handed. Instead, the Storyteller gets to decide what you’ve found in your pack. This gives the Storyteller an opportunity to present the player with something else useful to the situation, an odd item to use creatively, or simply add a little humor. The Storyteller can decide on anything, but the game provides a list of twenty suggestions that includes a silver hammer, a mysterious mask, and a fluffy pillow. How Do the Rules Handle Players Who Can Pull Anything? People experienced with storytelling adventure games might be a bit daunted by the idea of players with the freedom to pull out any item. I mean, how does a Storyteller stat out an automatic chicken launcher on the fly? Couldn’t a particularly creative player completely overpower the adventure or worse, bring it grinding to a halt? In Story Realms, our goal is make sure the focus stays on the fun. We want the story to keep moving forward, and we don’t want players to have to look up a bunch of odd equipment rules. That’s why we printed all the rules you need to know about how equipment works right on the Adventuring Kit! Take a close look. Do you see them? Try squinting. I find that when I cross my eyes, spin around 5 times fast, and then look, “something” definitely shows up. Still can’t see it? Well then you should check back later this week for part 3 of our preview. You’ll learn all the rules you need to know about how adventuring gear works and what it means to have the right tool for the job. Adventuring gear is a bit of a mixed bag in most adventure games. Shiny magic items with fancy tricks are always fun, but what about the simple, mundane gear that the heroes bring along to get the job done? It’s fun to imagine all of the cool gear your hero might be carrying, but it can be really tedious to plan for every little thing you might need. Do you really want to spend time in your heroic adventure game shopping for rope, tents, climbing gear, and a laundry list of minor items you may or may not ever need? Some adventure games sure think you do. Some games still include lists of over 30 items to consider purchasing all the way down to paying a few coin to buy a single torch. Hope your valiant hero didn’t forget to shop for that on the way to the deep dark caves. Hope your hero also remembered to buy the flint and steel (sold separately) to light it. 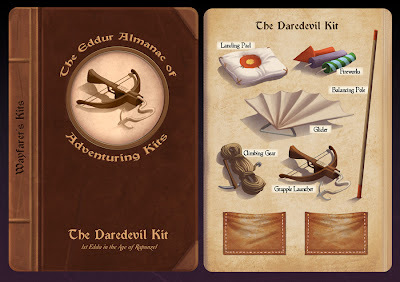 Story Realms makes gearing up your character simple and fun by using cards called Adventuring Kits. 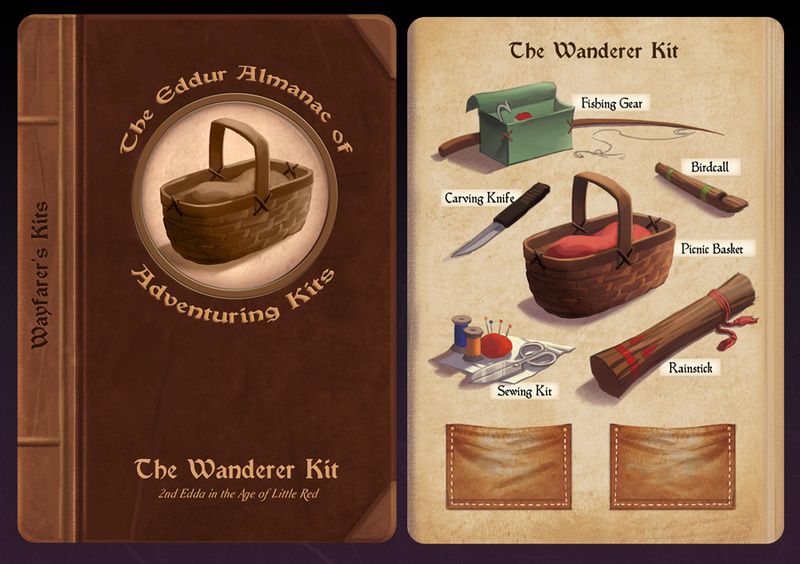 An Adventuring Kit contains a set of themed items to take along on your adventure that are each fully illustrated on the card. Just pick one of six different Kits and you’re ready to go. Over the course of the next week, we will be revealing all six Adventuring Kits from the game. This preview art has been generously provided by our publisher, Game Salute. The illustrations for the Adventuring Kits were done by the amazing artist Kelly McClellan and the design of the cards was done by our incredible art director, Dann May. 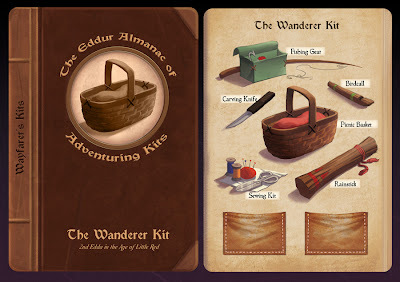 Yesterday, through Twitter, Reddit, and Facebook, we previewed the Wanderer Kit. An Adventuring Kit filled with items for survival and fun while wandering the wilderness. Today we are also showing off the Wizard Kit. A wizard in Story Realms isn’t any particular class of hero. Though some heroes are better at it than others, anyone can do magic. Instead, this kit is just a set of items that are useful to any hero interested in manipulating the magical elements and looking the part of a storybook wizard! As a hero, you are never stuck with same Adventuring Kit from adventure to adventure. Any time your hero is in a town, market, or some other place with an abundance of supplies (usually at the start of each play session) you can change to a new Adventuring Kit. This way you can pick equipment to suit your current quest or just try out something new. What if it’s not in the Kit? A keen observer will notice that there are only six items to an Adventuring Kit. What if you want something that simply isn’t there? A particularly keen observer will also notice that the bottom of each Kit has two pockets. Perhaps what you are looking for is packed in there. Tune in later this week when we reveal another Adventuring Kit and discuss how these pockets help ensure that a hero can be prepared for anything.